You were at office all day. You looked outside and it was bright and sunny. It is finally time to leave and meet your friends for drinks. The moment you step out it starts pouring heavily and you have to go to the pub, completely soaked and grumpy. If you have to worry about extreme weather conditions. With the weather changing constantly nowadays, it is almost impossible predict it. Nothing comes handy other than a live weather app, which can give you local weather forecast. There are many best free weather apps for Android that’ll help you get comprehensive information, so that you are prepared for what’s coming. Do more with your day by investing in a free weather app that you can trust. And you don’t need to look further than your Android phone to get it. 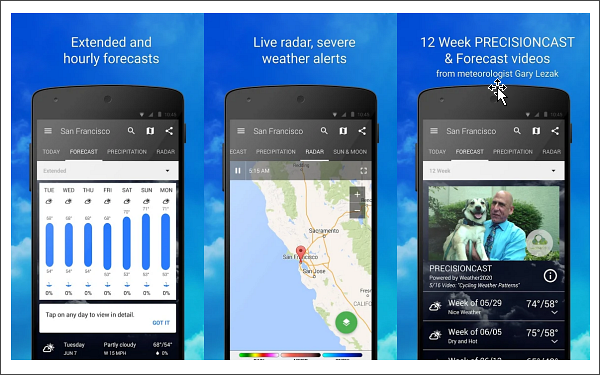 One of the most popular weather apps on Android, Weather Forecast gives daily and hourly updates of your local weather. It also has weather reports of the next day, next week, and next 10 days along with the current day, so you can prepare yourself and stay ahead at the game. You can select the exact location of any place you want to see the weather variables of. It can automatically find your location and give you the weather report. Information included in the weather report includes pressure, humidity, wind speed and direction, relative humidity, wind direction, wind force, dew point, and real time temperature. The most accurate weather app you’ll ever find, Today Weather has a simple yet user interactive interface. It is just more than a weather forecast app. When you open, you’ll see thousands of amazing photos of that day’s weather. If you want your photo to the uploaded on the app, you can upload it on flickr. Along with the usual weather variables, Today Weather also shows health-related variables, including pollen count, air quality, and UV index. The app works worldwide and is completely free. An interesting feature of the app is that it rings a rain alarm, when there is a high chance of rainfall. The only downfall of the app is that you can’t check weather of the next week. AccuWeather offers daily weather updates, which includes minute by minute weather forecast for the next two days. The free weather app for Android uses a technology called MinuteCast® that gives you accurate recordings making it the best Android weather app ever. Its RealFeel Temperature® technology shows you what the temperature is currently and how it feels like because usually, it is cooler than the temperature in temperate and frigid areas and hotter than it actually is in humid regions. AccuWeather also has weather radar maps to help you understand wind and cloud movement. It is a great learning tool to teach your kids about weather and how everything about it works. One of the most useful weather widgets for Android, 1Weather: Widget Forecast Radar offers the real-time weather forecast along with current phases of the moon and the sun. 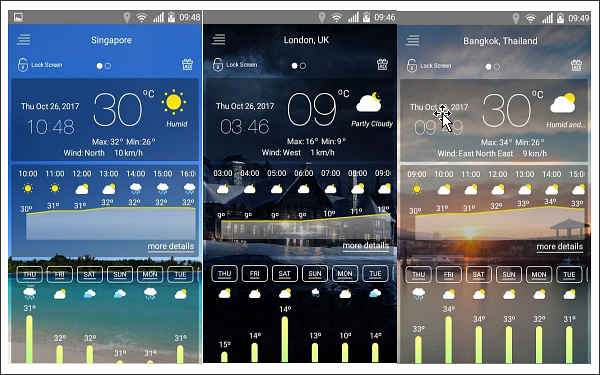 You can bookmark up to 12 locations on the weather and clock widget for checking weather forecasts. The forecasts are updated every two hours, while detailed forecasts are updated every one and a half day. You can view weather forecast of as many as 10 days in advance. It shows percent chance of precipitation, maps, and weather layers along with other common weather updates. Weather Life Pro is a paid app perfect for long term weather forecast use. Some of the weather variables that the app records include temperature, cloud, winds, chances of a hurricane, changes of a rainstorm, and humidity. It shows temperature in both degree Celsius and degree Fahrenheit. This trusty weather app also has a storm tracker feature that studies ocean currents to check if the weather is suitable for fishing. You can get up to 14 days of weather forecast from Weather Life Pro. All these weather forecast apps are different in their own ways. 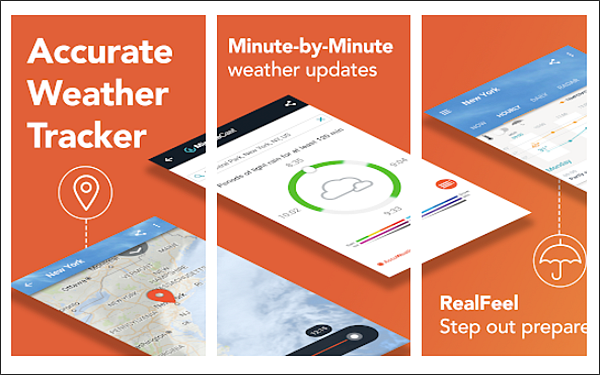 We love AccuWeather the most because it offers MinuteCast® and RealFeel Temperature® technologies, which isn’t present in other apps. It also shows allergy information, which is a huge plus if you are allergic to dust and pollens. Ads keep appearing on the app over and over again, which gets very annoying. Out of the remaining weather apps for Android, we like Today Weather’s photo gallery, which is refreshing. It has a rain alarm to alert you ahead of time, so you can reach home safely because the storm hits. 1Weather: Widget Forecast Radar shows phases of the sun and the moon, which is an interesting add-on, especially if you are a curious person. Again, there are too many advertisements. Weather Life Pro doesn’t come with the Real Feel technology, which is a little disappointing. It also has a lot of widgets, which makes it difficult to navigate. Other than that, the information available is absolutely accurate. 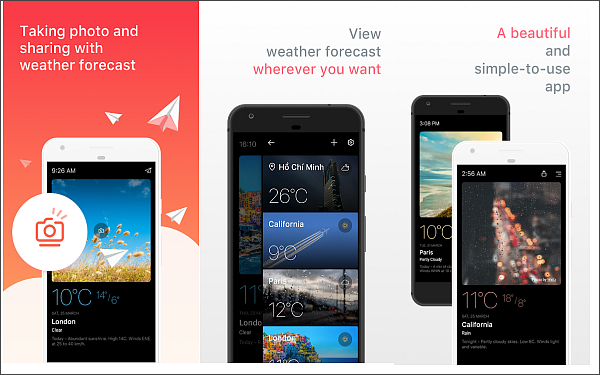 Weather Forecast is a simple, go-to app for accurate weather forecasts. Its radar map doesn’t work too well and it doesn’t show recordings of the previous day. Look for a weather app that offers all round information. Some have safety tips and shows photos of current weather in nearby locations. 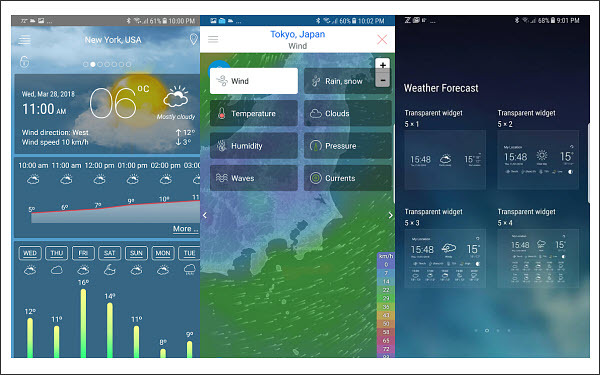 If your work demands you to have a weather forecast app on your phone, don’t be hesitant to paying for one as it will give you the most precise information compared to other weather forecast apps, which are available for free on Android OS. Although with the development of technology, people can get real-time or weather forecasts for the next few days through some apps or widgets , but just as the saying goes : “A storm may arise from a clear sky”, no one can really predict what will happen next moment. Maybe you suddenly learned that you won the lottery, but the next moment you were so excited that you deleted all the important data from your mobile phone by accident. Then how do you get the deleted files back? Well, in case you encounter such a situation, here we recommend a powerful data recovery software for you, that’s iReparo for Android, which specially designed for people who often are bothered by data loss. The program supports multiple data types and mobile phone brands, all you have to do is connect your phone to your computer and it will scan and parse out all deleted data from your phone. Then you can preview and recover deleted files from your Android phone with few steps. Of course, before that, you may have to download and install this software on your computer first.